Mendeleev's Periodic Table Is Finally Completed and What To Do about Group 3? The ninth of April 2010 was a rather special date for the discovery of the elements. First of all, it was the day on which an article was published in a physics journal to announce the synthesis of element 117. Second, and perhaps more important, it represented the completion of the 7th row in the periodic table, which contains 32 elements. As of that day, the periodic table of Mendeleev was finally completed in a way that it never was before. This is because there are now absolutely no gaps in the periodic table, although there may well be some new elements to follow in a 8th row that will probably begin to form very soon. Such a situation has never existed before because in the past there were always gaps within the boundaries of the elements that had already been discovered. To appreciate the full impact of this development, we need to briefly consider the history of the periodic table. It was discovered over a period of about nine years from 1862 to 1871.1 There were several different versions of the table published, but what they all had in common was this; if all the elements were arranged in a sequential fashion based on the weights of their atoms, the elements showed an approximate repetition after a particular sequence of elements. In these early periodic tables things appeared to be rather simple because the repeat distance, or length of each period, was the number eight throughout the table. Among these short-form tables, the one designed by the Russian chemist Dimitri Mendeleev is widely considered to be the most important, displaying Group I to VIII over 8 columns and 12 series (or periods) as shown in figure 1. Figure 1. Short-form or eight column periodic table as devised by Mendeleev in 1871. 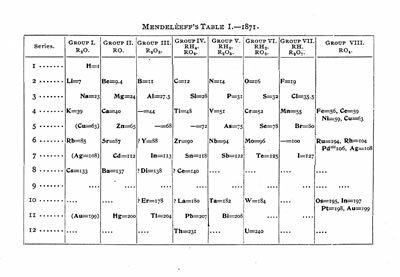 As the table shows, Mendeleev left a number of gaps in his table. He was more or less forced to do this in order to make the other elements fall into vertical columns to reflect their similar chemical and physical properties. The periodic table therefore began life with many gaps within it. 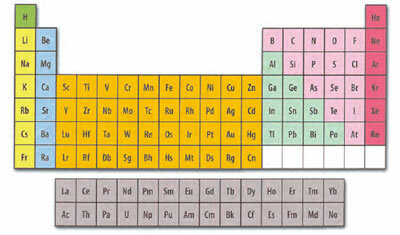 Mendeleev, unlike some of the other discoverers, made predictions about the properties of these missing elements. As is also well known, many of his predictions turned out to be remarkably accurate. As time went by, it became increasingly clear that a better design for the periodic table could be obtained by relaxing the notion that all periods have the same number of elements. It was realized that period lengths show a variation and that the 4th and 5th periods show a length of 18 elements, as shown in the medium-long form (figure 2). Rather than lumping together say lithium (Li), sodium (Na), potassium (K), copper (Cu), silver (Ag), and gold (Au) as Mendeleev had done, it is better to separate the first three from the last three of these elements to form two different groups. This change was also applied systematically to a number of other groups in Mendeleev's original table. As a further example, beryllium (Be), magnesium (Mg), and calcium (Ca) which Mendeleev initially placed in the same group as zinc (Zn), cadmium (Cd), and mercury (Hg) now gave rise to two new groups. The net result of these changes was to produce what is termed the medium-long form periodic table as shown in figures 2 and 3. Figure 2. Medium-long form periodic table as it looked circa 1915 with seven missing elements between the old boundaries from hydrogen to uranium. Notice that there are several gaps in this periodic table. In 1914, Moseley discovered that it was better to order the elements according to atomic number rather than atomic weight. This change resolved a number of "pair reversals" such as the one involving the elements tellurium (Te) and iodine (I) which were incorrectly ordered according to the atomic weight criterion. Meanwhile, a separate development was taking shape. As far back as the earliest periodic tables it had been evident that some elements could not easily fit into the system at all. This became such a difficult problem for Mendeleev that he handed the task to a Czech colleague, the chemist Boruslav Brauner who had some partial success. The elements in question included cerium (Ce), praseodymium (Pr), and neodymium (Nd) that are so similar that they appear to belong in the same place in the periodic table. But this would be going against a basic principle of the periodic table, namely one element, one place. Another solution was to place these so called rare earth elements into a separate row at the foot of the main body of the table as seen in figures 2 and 3. Some chemists realized that this move necessitated an even longer period consisting of 32 elements, but this did not have any serious influence on those who designed periodic tables who stuck with the medium-long format and its 18 columns. Starting in the 1940s, new elements began to be synthesized, thus extending the periodic table beyond the original 92 elements. Soon afterwards, a second period of 32 elements was discovered by the American chemist Glen Seaborg while he was in the process of attempting to synthesize more new elements. Seaborg realized that the elements actinium (Ac), thorium (Th), protactinium (Pa), and uranium(U) did not belong in the places shown in figure 2, but that they formed part of a new 14 element series which became known as the actinides. Now, the case for arranging the elements in a long-form table became more compelling. Seaborg and others began to publish long-form tables such as in figure 4. Curiously though, such long-form designs are still not the most commonly encountered format of the periodic table in textbooks and wall charts. This is likely because it is not very convenient to represent the periodic table in this more correct form. Such tables stretch a little too far horizontally and so tend to be avoided by designers of periodic tables, even though everyone agrees that they are scientifically more correct. One clear advantage that the long-form table has is that it lists all the elements in sequential order of increasing atomic number whereas the medium-long form displays a couple of anomalous jumps which occur between barium (Ba) and lanthanum (La) and another between radium (Ra) and actinium (Ac). In any case, whether the medium-long or long-form table was used, there were still several gaps that remained to be filled in the seventh row of the table. As more and more elements were synthesized these gaps were reduced until the last piece in the jig-saw puzzle was filled on 9 April 2010 with the announcement of the discovery of the elusive element 117. Figures 4–6 (top to bottom): Three different long-form, or 32-column, periodic tables with differences highlighted. Figure 4 (top): Version with group 3 consisting of Sc, Y, Lu, and Lr. Figure 5 (middle): Version with group 3 consisting of Sc, Y, La, Ac. The sequence of increasing atomic number is anomalous with this assignment of elements to group 3, e.g., Lu (71), La (57), Hf (72). Figure 6 (bottom): Third option for incorporating the f-block elements into a long-form table. This version adheres to increasing order of atomic number from left to right in all periods, while grouping together Sc, Y, La and Ac but at the expense of breaking-up the d-block into two highly uneven portions. In an article in the Jan-Feb 2009 issue of Chemistry International, page 5, Jeffrey Leigh correctly pointed out that IUPAC does not take a position on what should be regarded as the correct periodic table.2 There is no such thing as an IUPAC-approved table, contrary to the label "IUPAC periodic table" that one might see in some books or on certain websites. Leigh was responding more specifically to the debate that had been conducted, mostly in the chemical education literature, concerning the membership of group 3 of the periodic table.3 In this article, I propose that IUPAC should in fact take a stance on the membership of particular groups even if this has not been the practice up to this point. This would not of course amount to taking an official position on an optimal periodic table since it would concern the placement of elements into groups rather than any other aspect of the periodic table such as what shape or form it should take or whether it should be two or three dimensional. 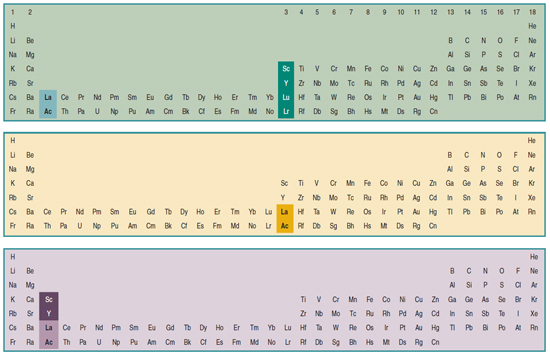 In addition to arranging all the elements in a more correct sequence of increasing atomic numbers, the decision to move to a long-form or 32-column table forces the periodic table designer towards just one possible option regarding the question of which elements to place in group 3. The natural choice, turns out to be the placement of Lu and Lr into group 3, as seen in figure 4, because the other option fails to maintain an orderly increasing sequence. I suggest that any reluctance to accept this grouping as opposed to the more frequently seen grouping of Sc, Y, La, and Ac (as shown in figure 5) stems entirely from a reluctance to display the periodic table in its 32-column format. If this obstacle is removed and the rare earths are taken up into the main body of the table the choice of how to do so is almost entirely in favor of a group 3 consisting by Sc, Y, Lu, and Lr. I say "almost entirely" because there does exist a third option, although this can be dismissed on the grounds that it represents a very asymmetrical possibility. As seen in figure 6, the third option requires that the d-block elements should be broken into two very uneven portions consisting of one group, followed by the insertion of the f-block elements and continuing with a block of nine groups that make up the remainder of the d-block elements. Indeed, this form of the periodic table is also sometimes encountered in textbooks and articles, although this fact does not render it any more legitimate. Of course, there may still be a preference for an 18-column table among many authors, in which case one can easily revert to the form in figure 3, but with the knowledge that the group 3 issue is now resolved. At the risk of repeating myself, it is this question which I believe is in need of resolution and not the issue of the best shape for the periodic table, or indeed, whether it should be presented in a medium-long or long form. I am not, therefore, suggesting a change of IUPAC policy regarding a commitment to an "optimal format" for the periodic table. The latter must remain as a choice for textbook authors and individual periodic table designers. Finally, given that the periodic table is now complete for the first time, and probably not for long, would it not be an occasion for IUPAC to turn its attention to the central icon and framework of chemistry in order to resolve a remaining issue that continues to confuse seasoned practitioners and novices alike? And who knows what discoveries might lie ahead if a more precise grouping of elements in group 3 were to be established after all the available evidence has been suitably weighed by the relevant IUPAC committees. Scerri, E.R. (2007), The Periodic Table, Its Story and Its Significance, Oxford University Press. Leigh, J. (2009) Chem. Int. Jan-Feb, 31(1), 4-6. Clark, R.W. ; White, G.D. (2008) J. Chem. Educ. 85, 497; Lavelle, L. (2008) J. Chem. Ed., 85, 1482; Scerri, E.R., (2009) J. Chem. Educ., 86, 1188-1188. Jensen, W.B. (1982) J. Chem. Educ. 1982, 59, 634–636. Scerri, E.R. (2011) A Very Short Introduction to the Periodic Table, Oxford University Press. Eric Scerri <scerri@chem.ucla.edu> is a chemistry lecturer at UCLA as well as an author specializing in the philosophy of chemistry and the periodic table.